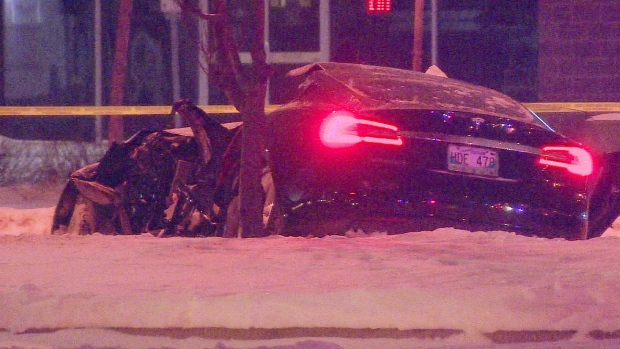 A man tragically died last night after his Tesla Model S got hit by a dump truck in Winnipeg, Manitoba. The accident is likely the first instance of a death in the Model S under “regular traffic conditions”. By “regular traffic conditions”, I’m referencing several reported fatalities after Model S’s drove down cliffs and in one instance, a thief died after he crashed his stolen Model S while trying to escape the police during a high-speed chase. The Model S has 5-star ratings from NHTSA and the lowest probability of injury of any car ever tested by the agency, which helped Tesla maintain a great track record even with now over 100,000 Model S’s on the road. But even with the car’s low center of gravity and large crumple zones, there are unfortunately still some impacts that can be devastating. A 67-year-old man is dead after the car he was driving crashed with a dump truck Monday night. It happened just after 8:30 p.m. on Century Street near Wellington Avenue. The man’s car, a Tesla, was going westbound on Wellington when it was hit by the dump truck going northbound on Century, police said. Our condolences to the family of the victim and a reminder for everyone to be safe on the road, especially under winter driving conditions during the holidays. Featured image: Model S owner crashed his Tesla at the Fremont store after taking delivery. Unrelated to the Winnipeg accident, but the image’s resolution wasn’t good enough for the feature.